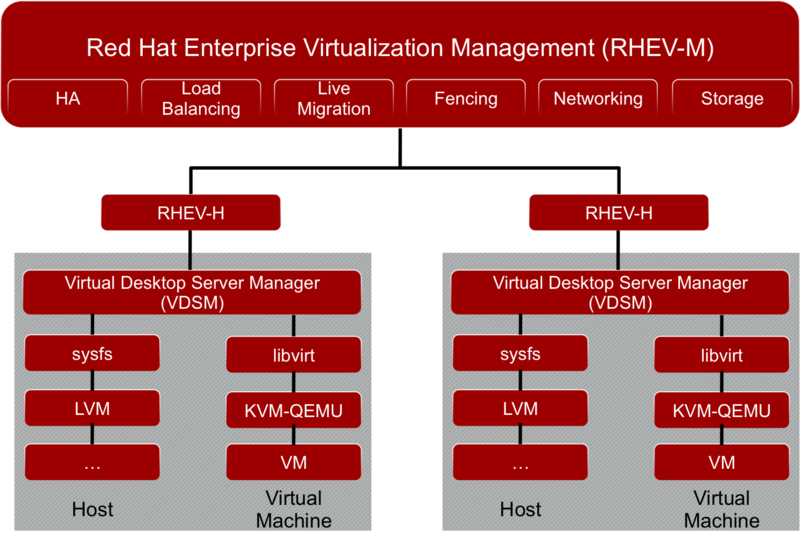 Red Hat Enterprise Virtualization has two main components: RHEV-H and RHEV-M. In this post we will be focusing on RHEV-M which provides a REST API and various SDKs. By integrating with RHEV-M we can integrate a powerful set of virtualization APIs into any applications, processes or workflows. If you are new to RHEV or don’t have a lab environment setup, check out this post on building a RHEV lab environment. Red Hat Enterprise Virtualization Hypervisor (RHEV-H) is a compact, full-featured virtualization platform built on Red Hat Enterprise Linux (RHEL). It has a very small footprint (less than 100MB) and is built from only a subset of RHEL components plus the Kernel-Based Virtual Machine (KVM). Red Hat Enterprise Virtualization Management (RHEV-M) is a virtual management console built on Red Hat Enterprise Linux (RHEL). It interacts with individual RHEV-H nodes using the Virtual Desktop Server Manager (VDSM). A VDSM agent is running on each of the RHEV-H nodes. RHEV-M allows administrators to manage multiple data centers and their network, compute and storage resources. In addition RHEV-M provides a central repository for storing virtual machines, disks, images and virtual machine snapshots. RHEV-M provides a common feature set such as HA, Load Balancing, Host Fencing, Networking, Storage and more across all hosts and virtual machines. RHEV-M is built on top of libvirt and allows for the management of many KVM (Kernel-Based Virtual Machine) hosts. Libvirt just allows for the management of a single KVM host. RHEV-M is downstream from the open-source project oVirt. Red Hat started the oVirt project and though the hypervisor backend is open (KVM, XEN, or VirtualBox) the project is currently focused on KVM. Originally oVirt was based on C# and .NET but has since ported to Java. RHEV-M has several components: Engine, Interfaces, VDSM Agent and SPICE. The RHEV-M engine runs on a standalone RHEL host. It inventories as well as exposes virtual resources and allows the administrator to organise those resources across many data centers. In addition it provides capabilities such as HA, authentication, load balancing, live migration, network management, storage management, virtual machine management, image management and monitoring across an entire virtual ecosystem based around the KVM hypervisor. The engine maintains a postgreSQL database for storing relational information about the environment. RHEV-M offers a CLI and a web-based UI built around the Google Web-Framework (GWT). Since RHEV-M uses GWT it is also possible to create plugins and add UI extensions during runtime. RHEV-M offers a powerful REST API and SDKs for Java as well as Python. Later in this post we will give some Java code examples and take a closer look at the SDK. The Virtual Desktop Server Manager is an interface abstraction built around libvirt. Since libvirt was only designed to manage a single KVM hypervisor it was necessary to extend capabilities to allow management of 1000s of virtual machines across many KVM hypervisors. VDSM provides the necessary scalability around libvirt. VDSM has a few components. It has a daemon agent that runs on the KVM hypervisor (either RHEV-H or RHEL + KVM), a client component and a manager that is built into the RHEV-M engine. RHEV-M uses SPICE in order to display the console of a virtual machine through user interfaces. SPICE is responsible for handling console graphics and sending control commands. In RHEV-H virtual machines or as they are referred to in KVM domains provide the building blocks for the RHEV platform. Most actions and things of interest are typically performed on virtual machines. Below are several code examples of typical things administrators would perform on virtual machines. RHEV is a powerful virtualization platform and certainly has not only the management but also feature capabilities to be on par with other virtualization platforms from VMware and Microsoft. The big advantage of RHEV over Microsoft or VMware is that everything is of course open-source and built in a thriving community. The industry has long wanted an enterprise open-source virtualization platform and now it has one! Hopefully this post was useful and informative. I was very impressed at the easy-of-use of RHEV-M interfaces and APIs. If you have any questions or comments please feel free to ask. I am trying RHEV-M and oVirt。But there are few documents. There are some documents depends on what you are looking for. Can I help with anything? What information do you need? We are planning to built a small production setup based on 2 powerful server with RHEV-H & a low end server to deploy RHEV-M. Is it possible to create a shared storage out of the disks available on those 2 servers using RHEV-M? Yeah sure you could do NFS but of course if a node goes down you would lose access to data on those disks. If you want to do that search my blog for rhv posts, I show how to do that. If you want HA then you need to mirror data between nodes, DRDB maybe? It’s not covered by rhv, once data is mirrored you could again do nfs. These options are basically hacks and only good for testing. If you want to do this property you need 3 nodes then you can use gluster and it’s integrated/supported by red hat. Otherwise you looking at expensive shared storage.